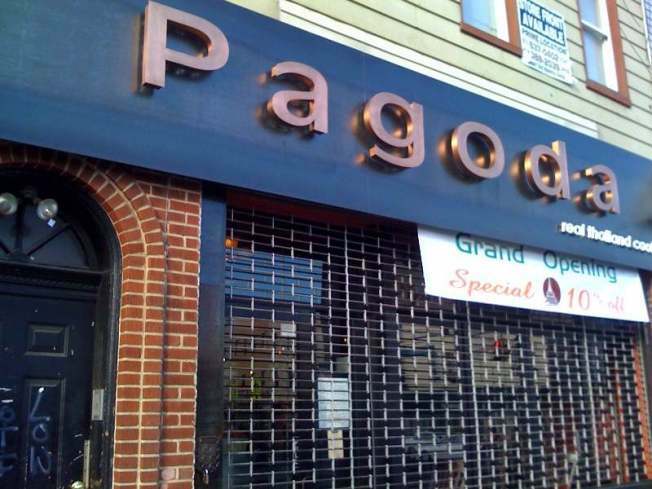 The storefront of Pagoda Thai shows little evidence of its gambling past. Those looking to make money can only save it on Pagoda's 10% off Grand Opening deal. Last summer, 333 Graham Avenue was a bustling storefront for OTB regulars, placing horse bets just steps from the Graham Avenue L stop and just a few blocks off of the BQE. But following the city's refusal to provide an essential "infusion of cash" last fall, a number of OTB's around the city began to shut their doors, including this one. But then, after months of construction between an 8-foot tall wooden fence, 333 Graham Avenue emerged as Pagoda Thai, a trendy-looking restaurant in a trendy corner of North Brooklyn. Each night of the store's opening week saw packed tables and a steady stream of delivery bags leaving its doors. And, despite popular Thai restaurants Sea and Tai Thai already calling the 'Burg home, Pagoda is located just far enough away from the center of things that they might be able to claim this part of East Williamsburg as their own. While Tai Thai might look like competition to the average take out enthusiast, a copyright by "TaiThai NYC" is listed on Pagoda's webpage, leading us to easily assume that Pagoda and the Williamsburg staple Tai Thai are sisters. As for the food, I was impressed. Pagoda offers a delightful blend of Thai and asian-influenced dishes, ranging from the staples like Spring Rolls and Fried Dumplings, to the more eccentric Curry dishes and specialties like the Pagoda Chicken Barbeque. Once inside, the decor allows you to forget the money lost, punches thrown and the smoke-soaked walls that once kept 333 pulsing. For a menu, visit PagodaThaiFood.com.